Mr. Gunn is a lifelong resident of Orange, Texas. He was a 1965 graduate of West Orange High School and was the class Valedictorian. He attended Lamar University in Beaumont, Texas on a full debate scholarship, receiving a Bachelor's Degree in Government in 1969. Upon graduation from college, Tommy was a Debate and History instructor at West Orange High School from 1969 until 1973 where several debate teams won State Championships. Tommy decided to attend Baylor School of Law and did so on a full scholarship and graduated in 1976 as the number one graduate in the law school class. He served as Editor-in-Chief of the Baylor Law Review and was a member of the Baylor Mock Trial and Moot Court teams. 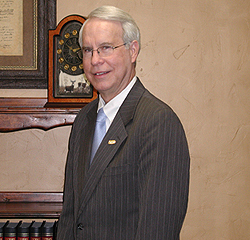 He returned to Orange in 1976 where he entered the private practice of law. He is a former President of the Bridge City Independent School District Board of Trustees and a past President of the Bridge City Rotary Club. He is also a former Director of the Orange Chamber of Commerce and served as City Attorney for the City of Pinehurst since 1988. At present, Mr. Gunn is Chairman of the Board of Orange Savings Bank, being a Director of the bank since 1997. He is married to the former Kathy Clark and they have four children and 5 grandchildren.